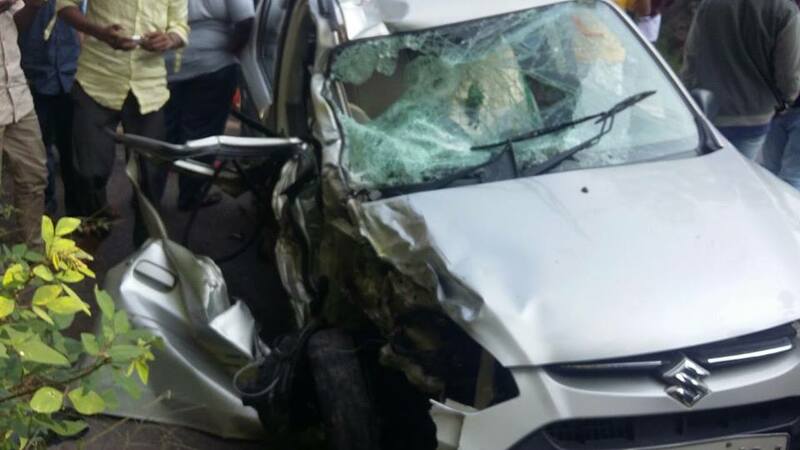 Few pics of a fresh accident have surfaced over the internet from Kollam, Kerala. 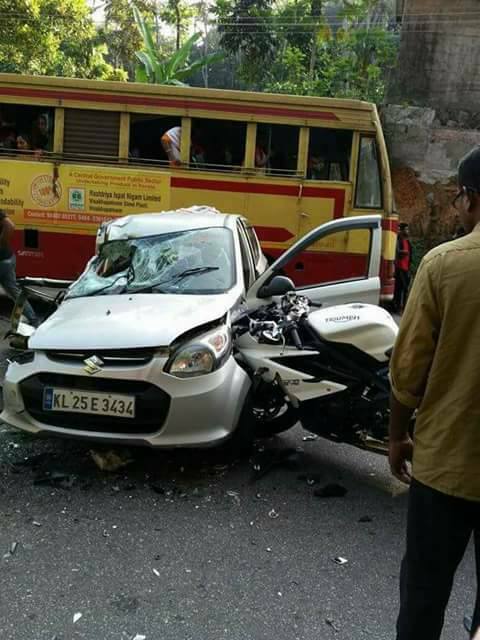 According to these images at Facebook, the crash involves three vehicles – an Alto 800 which has an ‘L’ sticker on its windshield, Triumph Daytona 675 and Kawasaki Versys 650. 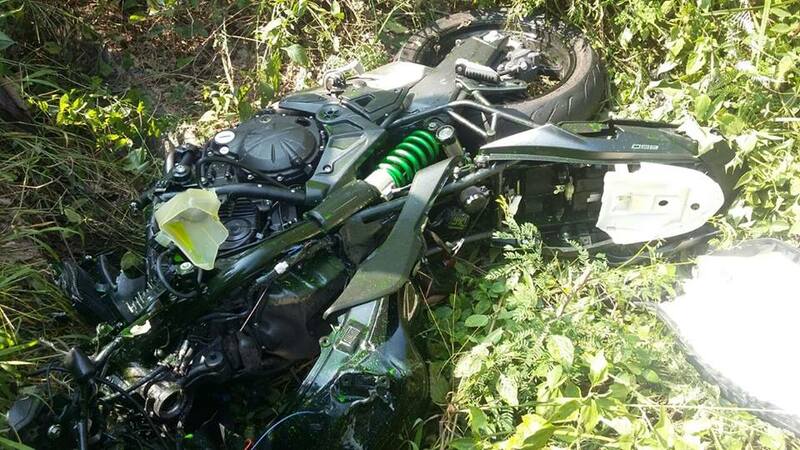 According to the widely believed report, the Alto was taking a U-turn (must have been a sudden manoeuvre) which compelled the Versys rider to go off-road and crash. The Daytona rider, who was following Versys, hit the car. The Versys rider reportedly lost his life and the car driver as well as the Versys rider have suffered multiple injuries, the severity of which is not known at the moment. 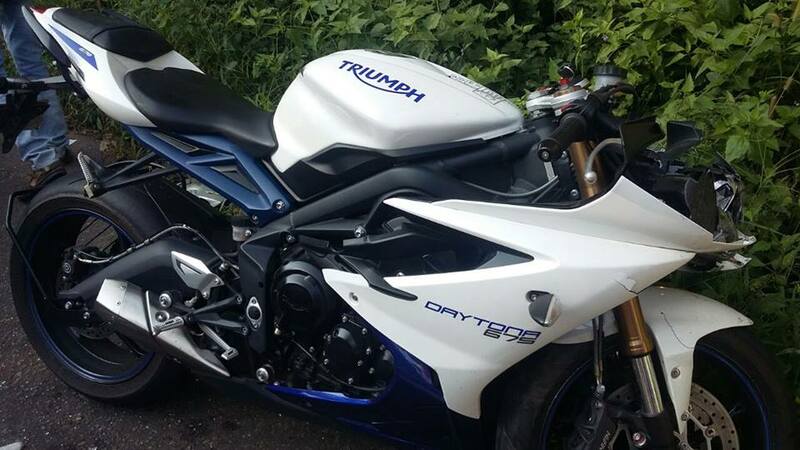 From the impact, the front wheel of Versys got knocked out of the motorcycle whereas the Daytona appears to have received relatively lesser damage. 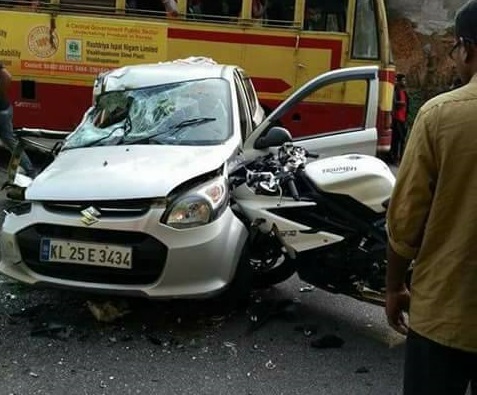 Alto, on the other hand, is damaged badly from the left side confirming that the major impact was on this driver’s side, whereas the following pic also suggests that the Daytona rider collided from the other side. There are other versions of the story as well but nothing is certain and its no point raising fingers at anyone. However, the crux of the situation is that – let us all be cautious – specially bikers (since we are at higher risks) and ride our motorcycles, however technically advanced they are, with responsibility. You should also remember that for a learner’s license (like Alto in this case), you should have a friend or a relative (who holds a valid permanent license) accompanying you. No gadgetry or technology can save you if you are mad with your machine. Also, try and inculcate better road sense within you as well as your friends and relatives. We pray for the departed soul and hope the injured get healthy soon.